The work is fun, no doubt there; but it never ends on this mission of exploration — particularly in the summer, when we conduct our annual spacecraft checkouts. We awakened New Horizons from its record-setting 202-day electronic hibernation just last week, on July 7. We’re now almost 14 astronomical units from the Sun (the official crossing date will be July 27), and nearing the halfway point between the orbits of Saturn and Uranus. And we’re going to be conducting an activity that we call Active Checkout Three (“ACO-3”). ACO-3 has been months in the making, and for the remainder of July and almost all of August — it’s show time! As you likely know, our general cruise-to-Pluto plan is to hibernate our spacecraft most of each year but wake her up each year for an ACO. As its name implies, ACO-3 is the third of our eight ACOs on the way to Pluto. ACO-3 is also — by design — the simplest, least cluttered and least complex ACO we have ever conducted. We purposely simplified ACO-3 to free up time for our small operations team to plan and test our Pluto core encounter, which we are on the hook to NASA to finish by the end of this year. To simplify ACO-3, we put off a trajectory correction maneuver until 2010, avoided flight software updates, all but eliminated cruise science, and told our instrument payload teams that we would not conduct pointed calibration observations as we have in past years. Instead, they must get by with the testing and instrument calibrations that could be conducted while the spacecraft is in spin mode (which is how we fly during hibernation). These restrictions pay off for us by shortening the planning and execution time of the ACO. Consider: ACO-3 took two months to plan, design, and test, and will take just under two months to execute. By contrast, ACO-2 took four months to plan, design, and test, and 4 months to execute. Functional checkouts of all seven scientific instruments. Brief science data collections for SWAP and PEPSSI to monitor the heliospheric space environment around New Horizons. Checkouts of every spacecraft subsystem — including both the prime and redundant hardware in each subsystem. Two months of careful tracking to improve our trajectory knowledge. Uploading instructions to take us through the next few months of hibernation, which we’ll initiate on August 27. As we glide across the vast vacuum of space between Saturn and Uranus, the recent telemetry collected from New Horizons shows that our bird remains healthy, though we are studying two spacecraft issues very carefully. The first is the still unexplained set of command and data handling computer reboots that occurred in 2007 and 2008, but have not re-occurred on New Horizons since. We’ve begun to study similar reboots that have taken place in the New Horizons ground simulator as a way of sleuthing out what’s behind these mysterious off-nominal events, but so far, we haven’t cracked the case and found a root cause. The other issue, which we first noticed in telemetry taken in late 2008, is a series of 10-20 percent over-currents in our radio system’s transmitter circuit card when it powers up. These over-currents are sporadic — sometimes they occur a minute or tens of minutes after we power up the board — and sometimes they do not occur at all when we power up. We’ve seen them on both the primary and backup radio transmitters in New Horizons. Although our engineering team is convinced they are not harmful, the fact that they began after almost three years of flight and are not explained, has prompted us to add extra testing of the transmitters to ACO-3. I’ll report what we find out in the fall, but it’s worth stressing that these two issues are more cautions than deep concerns. In the big picture, our spacecraft is among the most healthy in the solar system. Now let’s look to what comes next. 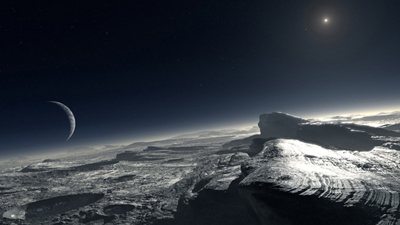 After ACO-3, New Horizons will hibernate most of the time from September 2009 through May 2010. But we’ll awaken it twice for about 10 days at a time to correct its antenna pointing, collect tracking data, and conduct spacecraft maintenance activities. These wakeups will occur during November 9-20 and then again during January 4-15. Following this next hibernation we’ll conduct ACO-4, which will be as chocked full of activities as ACO-2 was in 2008, and will include a small trajectory correction burn, another upgrade to our fault protection and autonomy software, some Pluto encounter tests, and a series of instrument calibrations and cruise science observations. All of this, of course, comprises just one year of the long, nine-year road trip to the ninth planet and its moons, on the frontier of the solar system. It’s our job to treat each year’s activities as carefully as we did the first, and to be good stewards of the spacecraft we’ve built, guarding against what New Horizons science team member Rick Binzel once termed as the fate of Charlie Brown, when Lucy stole his football just before he could kick it to score a goal in the old comic strip Peanuts by Charles Schultz. So every day, we plan, we test, and we constructively critique ourselves as diligently as we can. We have more than 1,270 days of safe spacecraft operations behind us on the way to Pluto, Charon, Nix and Hydra, but we still have almost 2,100 days to go before reaching that goal. Constant vigilance remains our best friend in conducting every step of this 3-billion-plus mile journey. That’s my update for now. Thanks for following our journey to a new frontier. I’ll be back in touch in September, after we complete ACO-3. In the meantime, keep on exploring, just as we do!